When looking to get married in Corfu we realised after some research that the only person who could provide the standard of wedding that we wanted was Aris. From the very start he made us feel that our wedding was going to be amazing, as it truly was and that everything was under control. His process was very consultative and he really got to know us over the course of numerous Skype calls to understand what would make us and our guests happy. Once we were happy with the plan we had a fun experience meeting with the various suppliers with coffee in Corfu town, it was a very relaxed and stress free experience. With regards to his suppliers Aris knows the very best in Corfu and will not let you down with the quality and the overall delivery from anyone you choose to work with. Over the course of our engagement we regularly caught up with Aris to discuss new thoughts or ideas either we or he had and we really enjoyed how much time we had to run through it all. Then it came to the wedding itself which was perfect and so much more than we had ever hoped. Aris was our celebrant and numerous guests commented on how lovely he was in the ceremony itself. Adding to this that everything went so well. In the build up Aris had told us he would deliver an elegant wedding, it was elegant, classy, romantic, magical and above all great fun for all the guests. 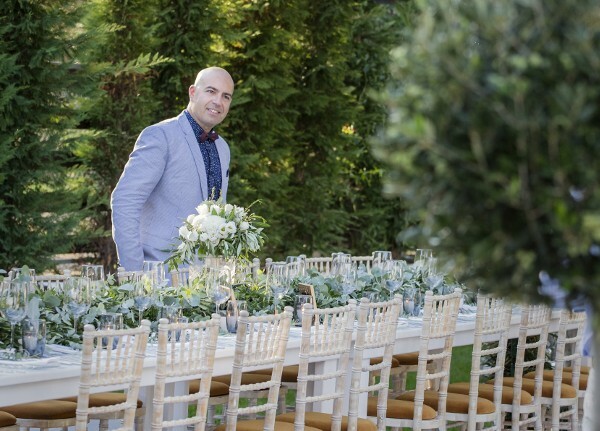 We would highly recommend Aris as a wedding planner to anyone looking for the very best.